Losing the popular vote to Hillary Clinton badly bruised President Trump’s ego—so much so that he’s cast doubt on the outcome of an election he won by repeatedly suggesting that three million votes cast were illegitimate. On Monday, efforts to combat the president’s newly formed voting commission were dealt a serious blow in court after a Washington federal judge dismissed a complaint by the Electronic Privacy Information Center (EPIC), which had argued that the commission hadn’t properly conducted a privacy impact statement required under a 2002 law for data collection systems. The judge, who was appointed by President Bill Clinton, concluded that the Presidential Advisory Commission on Election Integrity is not a federal agency, but instead an advisory panel not subject to the privacy law. 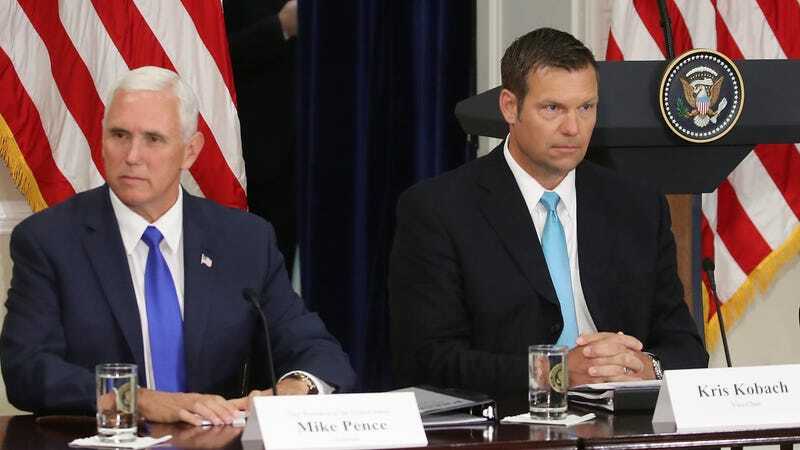 Chaired by Vice President Mike Pence, the commission has requested data from the 50 states on all registered voter, including but not limited to their names, addresses, dates of birth, party affiliation, and voting history, among other more sensitive items such as partial Social Security numbers. The voter data is to be amassed using a new system devised by the White House, which had previously offered two methods for transmitting the data deemed insecure by cybersecurity experts. As Gizmodo first reported, the email address offered by the commission lacked even basic security protections. An alternative system initially offered by Kansas Secretary of State Kris Kobach, the commission’s vice chair, is run by a US Army research team. It, too, raised significant privacy concerns because using it would have required state officials to take several technical steps, for which the commission provided no guidance. Sadly, while experts say the federal government should take immediate steps to secure the nation’s election systems from foreign hackers—the Department of Homeland Security says election systems in as many as 21 states were targeted during the 2016 election—the purpose of the president’s commission appears entirely political. Its creation followed Trump’s repeated use of unsubstantiated voter-fraud claims to argue he lost the popular vote because, he said, 3 million “illegals” voted in the general election. Three million is the magic number for Trump: Roughly 2.86 million more voters turned out for Hillary Clinton nationwide on election day. The 3 million figure was first promoted by InfoWars, a conspiracy website run by “performance artist” Alex Jones, which the president is known for reading. The bogus claim was originally conceived by Gregg Phillips, a Republican fundraiser, whom Breitbart News began describing as an “election integrity researcher” back in 2013. Phillips had concocted a baseless conspiracy theory that appealed to Steve Bannon, the current White House strategist who was then chairman of Breitbart. The theory proposed that Obamacare was never meant to help people who get health insurance; it was actually some machiavellian scheme hatched by the left to commit widespread voter fraud. Unsurprisingly, even three-and-a-half years ago, Phillips had traced this ploy all the way back to the Clintons—although, oddly enough, none of the Breitbart articles referencing Phillips in 2017 mention his Obamacare theory. Obamacare rightly struck fear in conservatives because, as a side effect, it promised to register millions of new voters. Under the National Voter Registration Act, signed into law by Bill Clinton, US citizens who apply for public assistance (in addition to those who visited the DMV) had to be offered the chance to register to vote. This means any expansion of Medicaid is also likely to cause a spike in voter registration. The 1993 law was passed because, even over two decades later, there are more than 50 million Americans eligible to vote who are not registered. But not everyone views this as something to remedy. This demographic of eligible-but-not-registered voters is disproportionately composed of low-income voters, people of color, and young Americans—people who, statistically, tend to vote for Democrats. This is the primary reason why Republicans consistently oppose efforts that would make it easier to vote; why they actively work to make it more difficult to vote; and why they paint any effort to enhance voter participation as increasing the risk of voter fraud. The GOP has a vested interest in suppressing voter turnout. This is one reason why so many people are concerned there’s an ulterior motive behind President Trump’s voter integrity commission. The principal reason Phillips opposed Obamacare, according to Breitbart, is that he believed “one of the underlying intents is to collect personal data and voter registration information and share it with the federal government.” He now advocates doing this exact thing on the Trump administration’s behalf. Phillips—whom the Associated Press reports was registered to vote last year in Alabama, Texas and Mississippi last year—has repeatedly refused to provide reporters with any evidence to support his claim. He will not say where his data comes from, nor what methodology he’s used to identify which voters are illegitimate. In other words, his assertions are entirely unscientific—which naturally matters little to a president with a documented aversion to science.